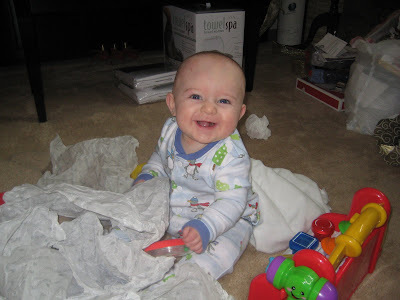 Jon David's first Christmas was a smashing success! 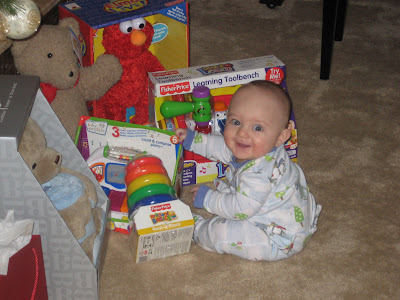 He really enjoyed his new toys, especially the Fisher-Price tower. This toy had been around since I was a kid and we used to call it the "onion ring tower". I only got him a few things because I know his grandparents on both sides have tons of stuff for him. We spent the day in our matching pj's going through all of our gifts. 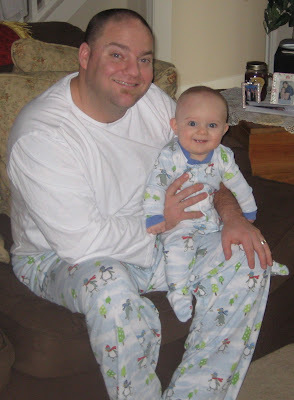 That's right, matching pj's. I got them last year when I was pregnant, dreaming of Jon David's first Christmas. It's so cheesy, but we'll have a good laugh about it when he gets older. If you don't like sentimental, skip to the end. For all parents who understand, remember your children's first Christmas. The joy you feel is so precious. We took tons of pictures and video and I hope it was enough to hold on to the feeling I had that day. Poor Jon, he found me bawling my eyes out on Christmas Eve. I choked out that I was happy, not sad! We've waited a long time for this, and I was overcome with emotion. This Christmas was the beginning of new traditions for our little family! We hope you all had a wonderful holiday and we wish everyone a healthy and prosperous new year!